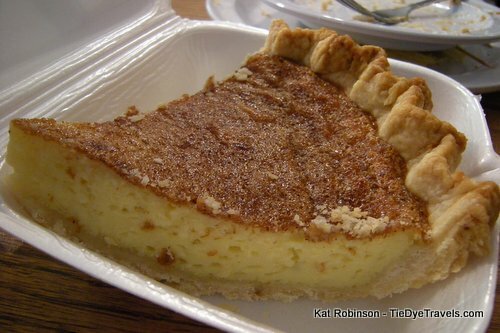 This story is adapted from Arkansas Pie: A Delicious Slice of the Natural State, with additional new material. 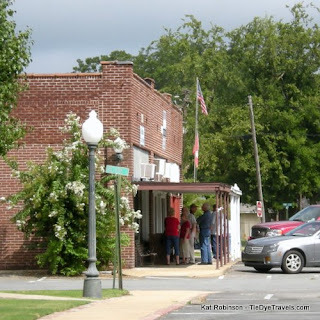 Five days a week at 11 a.m. in the miniscule Pulaski County burg of Keo, there’s a line a block long of hungry people patiently waiting outside a single-story building off Highway 165. They wait patiently, whether it’s cold or hot, for a chance to share a table inside the hottest… indeed, the only… sit-down restaurant in town. They’re not locals. The locals know to call in their orders and pick them up. 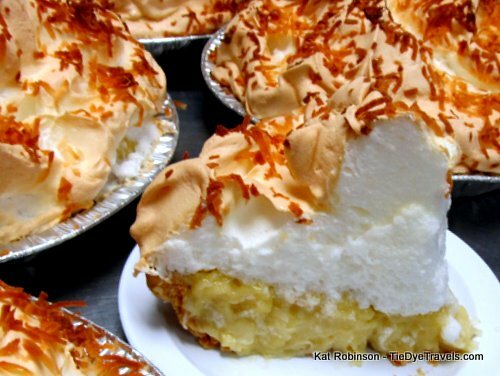 No, they come from all over the United States and elsewhere, for the opportunity to have a Keo Klassic sandwich and what Southern Living calls the best coconut meringue pie in the South. 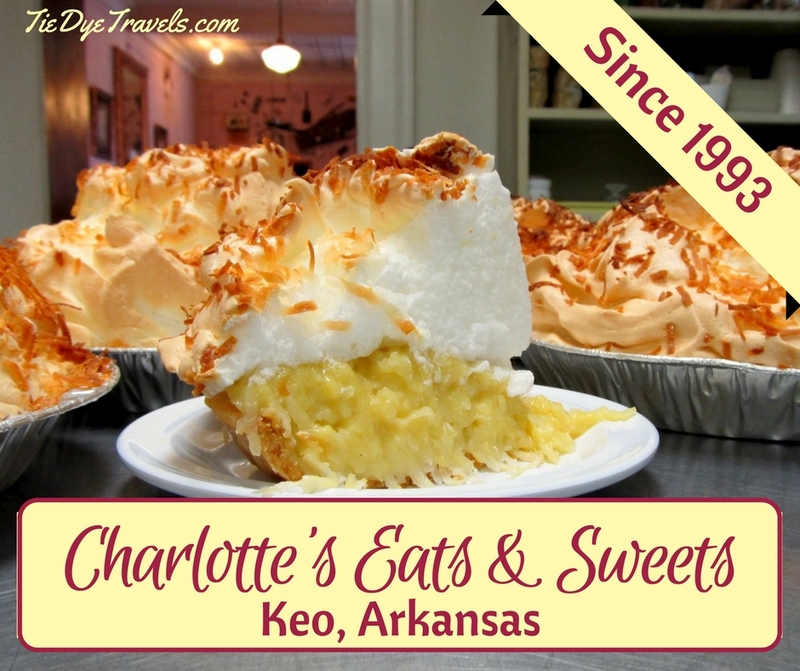 But Charlotte’s Eats and Sweets wasn’t supposed to be about pie. It was a short-term situation Charlotte Bowls got herself into back in 1993. The building, which used to house a pharmacy, was still full of the furniture and stuff the previous owner had left behind more than a decade before. There wasn’t much room, and she had to do a lot of clearing out before getting enough space for a tiny kitchen and counter together. The folks in Keo were grateful for a good spot to grab a bite to eat, and they encouraged Charlotte to expand her menu. She worked too on clearing out the pharmacy front to back and utilizing every bit of room in the building… and as she cleared it out, the crowd just continued to fill every seat, day after day. 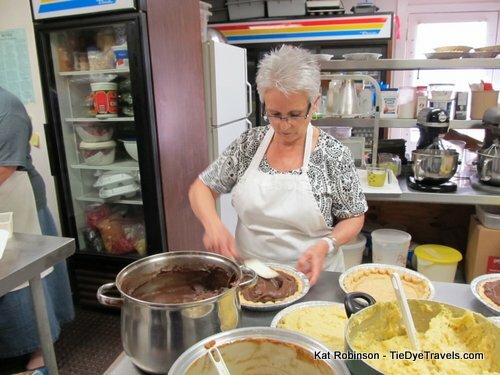 A lot of people have written about the pies at Charlotte’s. It came my turn to do so back in the summer of 2010. I went early -- too early, in fact. Got there about a quarter after 10 a.m. on a Tuesday. I parked down the block and caught up on email from my laptop while I waited. I’d been there a little while when I noticed motion to my right. 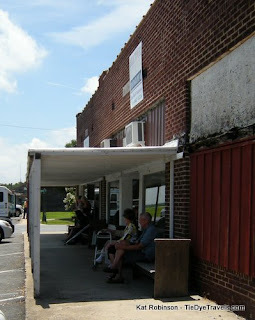 I looked up and noticed about a half dozen people waiting outside. It was 10:39 a.m. I kept watching for a bit, as more people arrived. A minute before eleven a couple of big vans pulled up. I realized my discretion at having parked so far away may have been ludicrous, so I went ahead and headed in. Inside, I glanced towards the back room; a few tables were already full, and the ones that weren’t had place cards reserving them for large parties. I quickly dashed back to the last remaining empty two-top up front and planted myself there. It was 11:04.
comfortable, an old-style storefront, one of the last remaining on the stretch of street bypassed by the highway some years back. Giant glass-front cabinets occupied two whole walls of the front room, and a significant bar back with mirror graced the third, standing tall behind an old walnut soda fountain. The tables were wooden-topped cast iron affairs, and they were all dotted with hungry folks eyeballing the pie list. 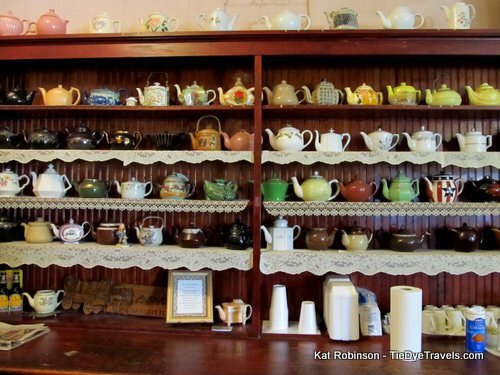 The cases held items for sale, like jams and home crafts and figurines. She smiled and moved on to the next table, handing out menus to the three ladies there and soaking up drink orders. Then she disappeared into a prep area out of view. The rattle of conversation increased. No one seemed upset about the pace or the fact that it was quite packed inside. It was now 11:20 and no one in the front room had received any sort of sustenance. But no one complained. That, to me, said a lot about the place. Not that there weren’t people who gave up. I saw twice where groups of four to six came in, took one look and left. Their loss. There were a dozen people waiting in the front of the restaurant, and it looked like there were a good number of people outside, too. She grinned and turned to the next table to pick up its order. The pie had been a hard choice. While the coconut pie at Charlotte’s is highly recognized, the chocolate is also well known. The whiteboard also had egg custard and caramel written on it – and while I loved egg custard I hadn’t had a caramel before. I wondered if it’d be like butterscotch. I promised myself if I managed to make it through the repast I’d already ordered that I’d ask for a piece of egg custard, too. My eyes were drawn to the delivery of a chocolate milkshake to the group table across the way. The tall glass screamed of dairy delights. It was the first dessert I had seen pass that morning, and it made my stomach rumble. Most of the tables were packed with people nursing beverages and none of the tables had real food yet. 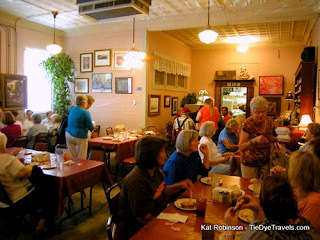 But that was fine, since most of the tables were abuzz with conversation. It’d taken 15-20 minutes just to get that drink order and here it was 11:30 and I was really starting to feel hungry. I heard the hostess, Kimberly, taking orders over the phone. There seemed to be just as many call-in orders as eat-in ones, and I couldn’t imagine just how busy that kitchen must have been. I just marveled -- all those people waiting, all the ones already seated wanting food, what kept them there? Was the reputation of the place really that good, or was it the food? For heaven’s sake, it was a Tuesday morning -- not necessarily the busiest time of the year, eh? Kimberly came over and bussed the table next to mine as she took an order on the phone. 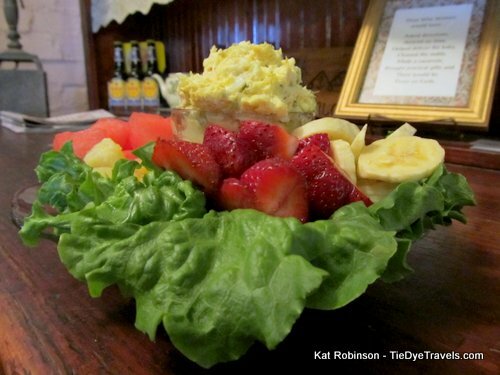 My eyes wandered back over to the specials board, which was advertising a Fresh Fruit Plate with watermelon, strawberries, grapes, pineapple, bananas, cantaloupe and poppy seed dressing with a choice of chicken salad, tuna salad or cottage cheese and garlic biscuits to boot for $8.25. I was starting to see this special speed by me on its way to other tables. All at once two of the waitresses swept into the room with meals for the group of seven on the other side of the front room. 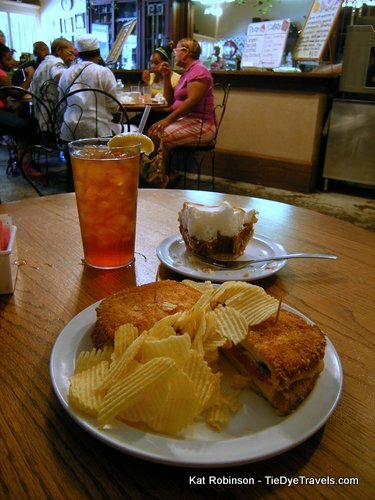 Grilled ham and cheese sandwiches, round burgers and clubs were doled out, each with their cursory stack of rippled potato chips and a hearty slice of pickle. The line had been constant, staying at even numbers despite the small influx of people as tables became available. At 11:40, few had received their meals but still there was no complaint. I heard my waitress tell newcomers at another table “Cobbler is Thursday, remember?” and give her wan smile again. I noticed she was taking dessert reservations with each dinner order. Apparently there is some small fear that a particular type of pie might run out before the customers get the chance to order. In the back, it’s a different story, where the big tables reserved early on were being served. The noise level never dipped, conversations continuing in-between bites of sandwiches and salads and of course the inevitable pie. There was a plunk on the table, and I looked up from my notepad where I had been quickly scribbling notes to catch glimpse of my waitress and her earnest smile. “Your sandwich will be ready in a minute, hon,” she beamed at me, refilling my tea. I smiled back and picked up my camera. As I snapped away, I overheard one of the ladies at the next table mutter “it’d taste better if she ate it.” I smiled in their direction, and they nodded back. 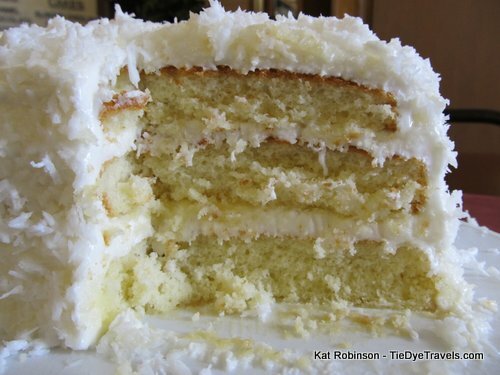 It was hard to shoot, with that decadent layer of meringue all full of bubbles and the custard… I shot it, but I couldn’t wait for the rest of my lunch. One bite, and I knew I’d chosen well. That lovely burnt sugar taste of the custard, a caramel made from scratch and not some melted lump of stuff from Kraft, a gorgeous taste that could make you cry. 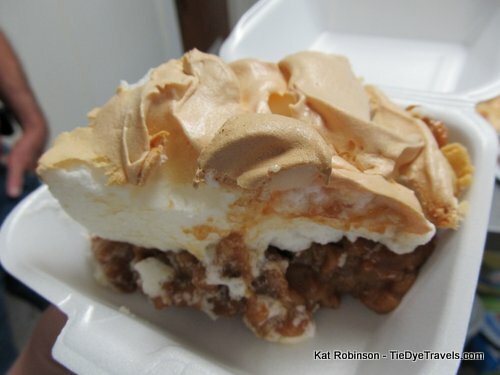 The meringue, firm and yet able to grasp the custard well, was toasted on top, almost burned but not quite, attaining a burnt sugar essence in its flavor. All of this sat on top of a lovely hand thrown butter crust that mated well to the whole pie. I could not help myself. I had to dig in. Mere moments later my plate arrived, and I looked up at the waitress guiltily. She just smiled. I’m sure I’m not the first person who’s passed through the doors at Charlotte’s and eaten dessert first. Well, I had to work, you know. This was, after all, what I did. I put down my fork and started shooting the sandwich under its cover of rippled potato chips. The Keo Klassic’s nice crust made by the parmesan garlic batter on the grill was crispy, while the bread underneath was still white and fluffy. 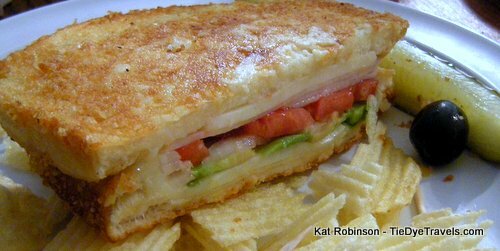 The thin layers below spoke of tastiness -- Monterrey Jack cheese, smoked turkey breast, tomato, white onion, avocado and another slice of Monterrey Jack. It was all somehow smooth and juicy at the same time, holding together with each bite. It was soft in the middle, and warm, and like this incredible interpretation marrying grilled cheese and a fresh turkey sandwich. I adored it. You wouldn’t think of reservations for a down-home establishment like Charlotte’s, but it really is that popular. I heard my waitress tell the table next to mine that a church group of 22 had come in and had stalled up the orders a bit. The ladies at that table waved her off, not concerned about the time it had taken to receive their order. Time’s not a big issue for most diners here, I came to find. I was about halfway through the sandwich when the waitress came to my table. “Can I get you anything else?” she asked as she freshened my tea. “You got it!” she beamed. She pulled out my check, marked it and flipped it onto the table. 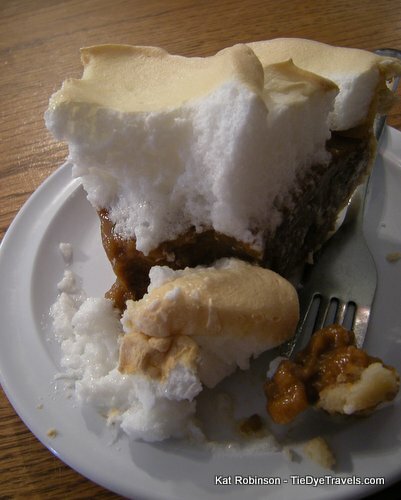 I finished my sandwich and returned my attention to the pie, which had been calling my name throughout the meal. It was just as good if not better. 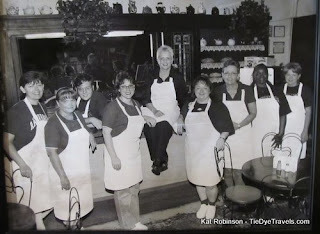 I heard another waitress call for a party of eight to follow her to the back about the time my egg custard arrived in its little clamshell box. I couldn’t help but photograph it right then and there. 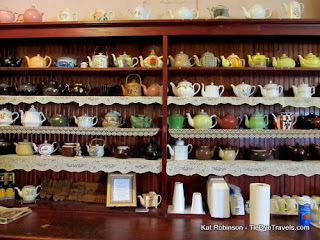 Then I took one more swig of my tea and hopped up to get in line to pay. There were, after all, people waiting. My table was bussed and ready to go before I even got to the head of the line. Paid up, a couple of bucks handed off to the ladies at the next table to hand to my waitress when she came back around again and I was out the door. Another dozen people were standing around and sitting on provided benches, calmly waiting their turn despite the 90-something degree heat. It’s amazing to me that such a humble place receives that sort of attention. I should have expected it -- after all, when I mentioned that day on Facebook that I was in Keo there was a collective swoon of pie lovers. But nothing prepared me for the volume of people I would see pass through those doors. After that first visit, I became one of the folks who'd call my order in - always a Keo Klassic turkey without onions and a slice of caramel pie. I'd place my order first thing in the morning, dawdle around and head out to pick up my order about 11:30. I probably got plenty of dirty looks. But I had a great meal. Couple of years later, I went in one morning to see how that operation happened each morning. Charlotte and her staff were already into making the day's pies at seven that morning. I was there with a crew from Jones Teleproductions, for a video that would eventually be shared through the Arkansas Department of Parks and Tourism. And finally, I had a question answered for me. 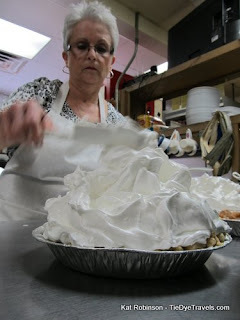 As I watched her dob huge mounds of meringue atop the custard pies, I asked her why she didn't just make more pies. Her amswer? She had no intention of making any more pies than would fit in her oven or on her counter. I can respect that. attention and praise of any food writer. They're just overshadowed by the magnificence of those pies. And even on the very rare day that even the cakes are gone before one chooses one's desserts, there are handmade ice crema shakes, thick and goopy and nigh-on incredible. But do you see mention of them anywhere? Well, now you do, but you know what I mean. And then there are the delightful fruit and salad plates... which, when summer is at its apex, are the perfect summer lunch: tuna or chicken salad surrounded by fresh fruit on a bed of lettuce. Simple, yet elegant, and maybe you won't feel so guilty getting that pie after. 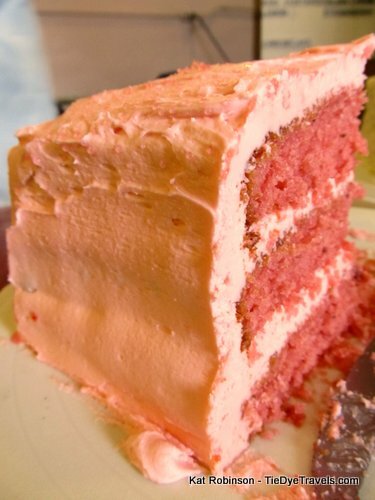 So next time you're in the area and it's before 11 a.m., consider going over and getting in line at Charlotte's Eats and Sweets. And if you're crushed on time, just call in your Keo Klassic and ask to reserve your slice of pie, You'll be glad you did. I worked with Charlotte many years ago in an office in Little Rock. I am so proud and happy for the success she has made. You could never find a sweeter or nicer person.